We had a good year on our homestead. Although the garden was not as productive as I hoped, I was still able to freeze, can, and pickle plenty of veggies to last us this winter. Warm weather veggies from our garden. We have plenty of jam, jelly, peaches, plums, pickles, and Applesauce from Wild Apples put up in the Canning Cupboard that my Dad made for me. Applesauce made from wild apples I foraged this fall. In fact, that cupboard is chock full and I have more goodies on other shelves in our basement, just waiting to be eaten while the wind blows and the snow falls. The canning cupboard my Dad made…filled to capacity! I really enjoyed making brine cured pickles in a crock like my Gram used to make. We still have some of those pickles in our refrigerator! Keeping the tradition of my Gram’s kitchen alive! 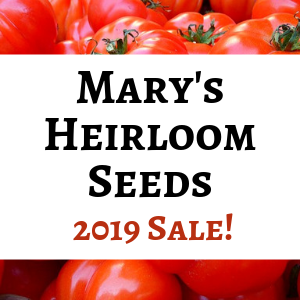 The Pink Oxheart Tomatoes from Mary’s Heirloom seeds were delicious! I added White Pekin Ducks to my barnyard this spring. 20 Ducklings arrived in April and I had fun watching them grow up. Less fun was the butchering process, but it was necessary to reduce the numbers to a manageable level. We have plenty of ducks in the freezer still and there are 4 hens and 1 drake in our coop this winter. I hope to raise some more ducks for the freezer this spring, but in the meantime we are enjoying their eggs in our baked goods. Duck eggs all lined up and ready for eating or making baked goods! I hatched some little balls of fluff from our own mixed breed chicken flock in September. It’s always fun to see the little chicks hatching and growing up. Pretty soon I’ll be putting the extra roosters in the freezer or a big pot of soup. Hatched at home…chick from our own fertile chicken egg. I raised my last batch of Cornish x chickens this fall and put them in the freezer. From now on I plan to raise our own chicks for butchering. We have one Cornish x pullet that is laying very well and I hope to add her genetics into my chicken flock for better meat production. This Cornish X pullet is laying an egg almost every day. We’ve had our share of problems with predators picking off our chickens this year. We had to ‘eliminate’ a possum that was getting in the chicken coop to eat the eggs this spring. I know that possums can do a great deal more damage than egg thievery. Last year we lost 26 pullets and hens to a possum rampage. This year we’ve lost hens to a fox, and a few more disappeared but I didn’t see what predator took them. I suspect the fox may be responsible, but it could have been a hawk. Predators are a constant threat on our homestead. Not all the news this year has been about our humble homestead. We live 600 miles from our families and it’s hard to be so far away. However, we try to make it back to visit them every year for a week or two. View from my parents’ back porch in New York. I hope you had a wonderful year on your homestead in 2013! Did anything exciting happen in your neck of the woods? Merry Christmas from Our Foster Puppy! Turn Over a New Leaf Giveaway! A great review, thanks. We live life like this in southern France. Buzzards and eagles are a great problem taking our chickens. We have some in a large flight made from a metal framed tunnel, but the just put up some netting in the llama compound above llama nibbling height. So the chickens can escape under there and the llamas protect them as well. But I wouldn’t like to be without the buzzards or eagles either! We have Turkey Vultures here, but them seem more interested in dead things than my chickens. The eagles live closer to the rivers and lakes and I have never seen them hunting my chickens. I do have to watch for hawks and other predators. It sounds like you have a great system for protecting your birds! I didn’t know that llamas were protective like that…that’s great! And I agree, even though I lose some chickens, I wouldn’t want to live without the wildlife. 🙂 Thanks for sharing your experiences with homesteading in France! Just found your blog in a round about way through “Living Green and Frugally”. Our homestead is comprised of my disabled husband, myself, one of our 30-something daughters and her 7 year old son. When there’s a need for more muscle, our son-in-law helps us. After a hiatus of many years, I’ve returned to pressure canning, and have been having great fun! My family has been really enjoying the results! We have a flock of 14 ducks, divided pretty equally between jumbo Pekins, Rouens, and Swedish. Love watching their antics! About half the flock is headed for the freezer next week. We also have about 30 laying hens, and can’t wait to see how many chicks God gives us next spring! Sounds like your family is doing an amazing job of homesteading! How wonderful that you’ve been able to take up pressure canning again. 🙂 I’m sure your flock is keeping you busy and well entertained. Best wishes with the butchering and chick hatching in the spring! 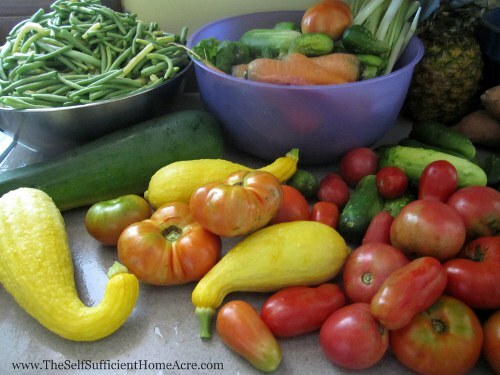 Stop by and give us an update every now and then…I love to hear from my fellow homesteaders! That is a beautiful wood and glass pantry cupboard! I just started making my own applesauce – so simple and tastes way better than bought in the store. It made me smile to see your duck eggs. A couple of years ago we had a flock of Indian Runners, Khaki Campbells, and Cayugas. We sold their eggs at the farmer’s market, where they were quite the novelty. People had never heard of baking with duck eggs. We were always amazed at how hard they were to crack. We have a small flock of laying hens, 9 now, and 2013 was a good year because none of them died! Thanks so much for stopping by and sharing your 2013 highlights! Fantastic review!!! Looks like 2014 will be another adventure.